This Eggless Chocolate Cake is made using condensed milk. It is vegetarian with the added bonus of few other indulgent ingredients making it very moorish and super delicious. The first time I made this cake it was merely a trial run, I had a big jar of Nutella that I had to use up, and so why waste I decided to add it to my chocolate cake. It turned out really good and here were are tried and tested it has become a very popular one since. 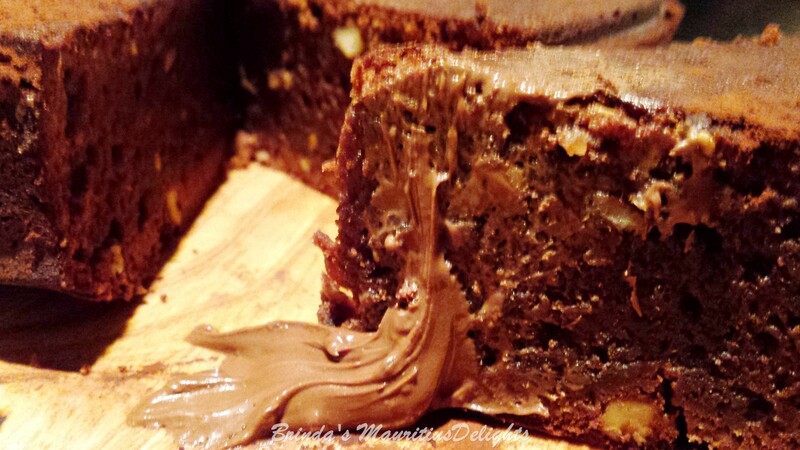 Being a nut lover I added toasted walnut to this already rich cake making it even more tempting. My pleasure to share with you all because I know chocolate cake is a hit with almost everyone. Preheat the oven to 160°C. Grease and line a 10 inches round tin with greaseproof paper and dust the sides with some flour. Peel and mash the bananas into a smooth puree. In a stand mixer or large bowl, add the condensed milk, banana puree, Nutella and melted butter. Mix all until smooth and well combined. In a separate bowl, sift the cake flour, cocoa powder and baking powder. Gradually add the flour to the wet mixture, whisking until smooth. Add the yoghurt and mix well. Once all the dry ingredients have been incorporated, fold in the toasted walnuts. Leave the cake to cool then gently turn the cake out onto a cooling rack. Once cool down place in an airtight container or wrap in cling film. As it’s a rich chocolate cake the outside can dry quickly and harden (as chocolate tends to harden as they cool down), by wrapping the cake in cling film this will ensure the cake remains moist. I do that with most cakes which I find helps the moist texture. To serve, dust lightly with cocoa powder. I like to warm a slice of cake and have it with cold ice-cream or serve with a generous splash of Nutella or pouring cream straight on top. The warm and cold combination works wonders. This cake will keep well for a few days so long it’s wrapped in cling film. I like to cut a slice and warm it in the microwave for a few seconds, which makes it moist and soft. Brinda’s Note : You may substitute the Nutella by using just plain good quality cocoa powder therefore increasing the amount of Cocoa powder instead of 50gm make it 150gms. You might want to do that if have a nut allergy as Nutella contains hazelnuts.